it's been raining for most of the afternoon here with no let up in sight, so that always puts me in the mood for movies and snuggleling under quilts. 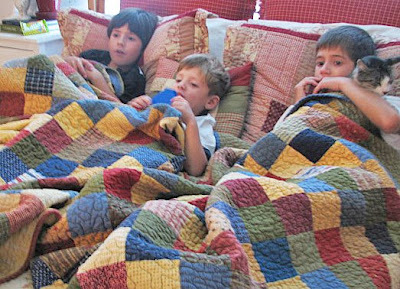 the boys loooove to use thier quilts that i made for them (i'm a meany and only let them use them for special occasions because it cost me so darn much to make them...i'm currently collecting fabrics from old jeans , old shirts of theirs, and old sheets of thiers to make them each every day quilts, i know this will take forever, but whatever right?! and look at these yummies from the garden (not mine sad to say but from a neigbors) i cut it open and water just ooozed out of it! YUMMY!!! so we had vegies sauteed, i liked it more than the kids...but i'll just keep starving them till they enjoy them as much as me! just kidding. Looks divine! Both pictures. How did you like the book? First off congratulation on letting the kids use the quilts...I know that took a lot of courage. :) Also, chick flick are ok when I'm around too. I had an epiphany over here in that when you are happy, I tend to be too. Go figure only ten year to figure that one out! This is such a great post...just everyday things that make living in your home a good thing for your little ones and you.. I am sure these kinds of posts bring Jake a lot of comfort in knowing how well they are being cared for while he is away. You are doing a great job, Vanessa! You enjoy those Chick Flicks too. If you get a chance go see Mamma Mia at the movies. Just lots of fun and relaxation. Meryl Streep is amazing. Thank you so much for the quilt tutorial. That's just what I needed. You are a pro at describing things so girls like me can get it too. Everything you make is cute. I love me some quilts and zuchini----fabulous---We totally have to get together this week, call me or email me when you want to---just depending on what's going on, we can decide where to meet!!!!! FUN, FUN, FUN! 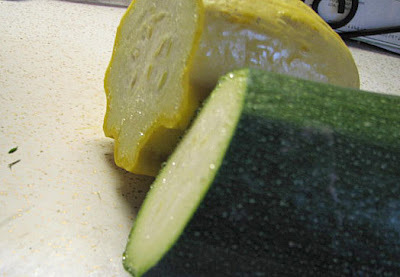 Mm, delicious zucchini, beautiful quilts and rainy days. Sounds great! Maybe it's because I don't quilt, but even with your awesome visuals I am lost. Just looks hard to me. I love that your husband posted. What chick flicks are you watching? I am jealous of that quilt, I love the back with the binding, the colors are awesome. love the quilt! and i love the pillows they are laying on- i have the same bedding set! hope you enjoyed your movies! 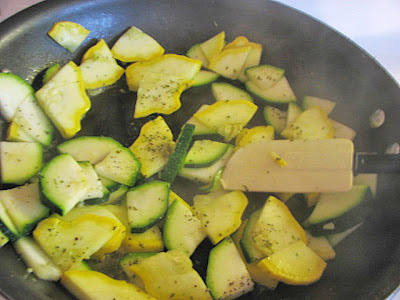 I love squash and zucchini sauteed! Yum! And... way to look on the bright side!